Moonstone is noted for a floating light effect and sheen, called adularescence, which has been compared to the light of the moon. 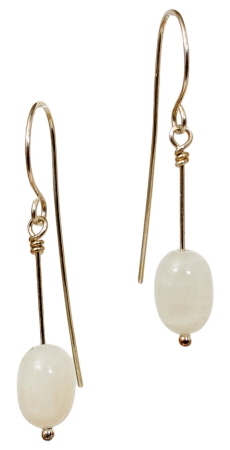 Dreamy white in color, these earrings are simple in design, yet classy. Earwire extends long behind earring and is hand formed in argentium wire. Earrings measure almost 2 inches in length and weigh less than 0.05 oz each.